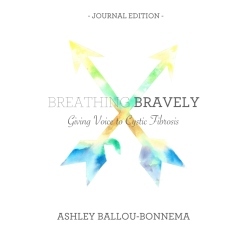 (Full Color) Add your own voice in this special journal edition of Breathing Bravely: Giving Voice to CF. Breathing Bravely: Giving Voice to Cystic Fibrosis is the passionate story of Ashley Ballou-Bonnema and her journey through the seasons of Cystic Fibrosis. Within a single cycle of seasons, Ashley's journey and experience are witness to life's joys and heartaches while breathlessly rooted in gratitude. From the grip of Winter's harsh wrath to the abundant life filled blossoms of the Spring, Ashley's perseverance, voice, and vulnerability resonate deeply within each of our own journeys. Specialized artwork, photos, and journaling prompts follow each chapter. Extra space devoted to writing and sharing your own thoughts. Good for self reflection or book club discussions. 8.5in x 8.5in Full Color. (Black and White Read Through) Breathing Bravely: Giving Voice to Cystic Fibrosis is the passionate story of Ashley Ballou-Bonnema and her journey through the seasons of Cystic Fibrosis. Within a single cycle of seasons, Ashley's journey and experience are witness to life's joys and heartaches while breathlessly rooted in gratitude. From the grip of Winter's harsh wrath to the abundant life filled blossoms of the Spring, Ashley's perseverance, voice, and vulnerability resonate deeply within each of our own journeys. 6in x 9in Black and White.